“It makes people smile,” says Tim Ohashi ’11, summing up the swell day that he spent with the famed Stanley Cup. Getting to spend a whole day with the Stanley Cup — it’s actually closer to 16 hours — is a grand hockey tradition accorded each member of a championship NHL team. Ohashi, the video analyst for the champion Washington Capitals, got his chance on Monday, July 2. 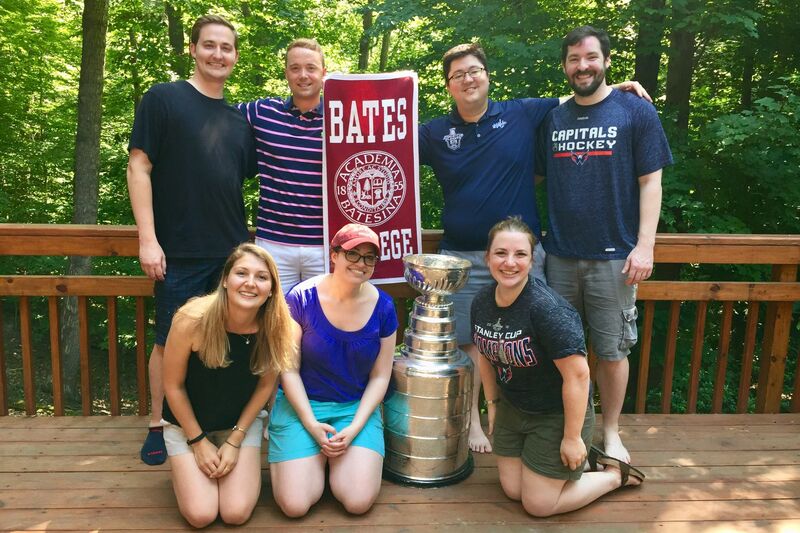 Some of the smiling people on Ohashi’s day with the Cup were good friends from Bates, including his girlfriend, Nicole Kahn ’10, Elena Mandzhukova ’15, Jared Quenzel ‘13, Brian St. Thomas ’11, Lila Totino ’10, and Luke Wamboldt ‘11. Many, many others came away with a Cup-created grin on Monday, such as the stream of folks (Ohashi estimates about 300) who came by his table at a local restaurant at lunch to see and be photographed with the Cup. “Everyone was smiling,” says Ohashi, who joined the Capitals coaching staff in 2014 as a part-time intern and quickly earned a full-time job. “He’s the smartest processor of information I know,” video coach Brett Leonhardt told The Washington Post in 2016. Ohashi knew that he’d be playing second fiddle to the siren song of the Stanley Cup most of Monday. 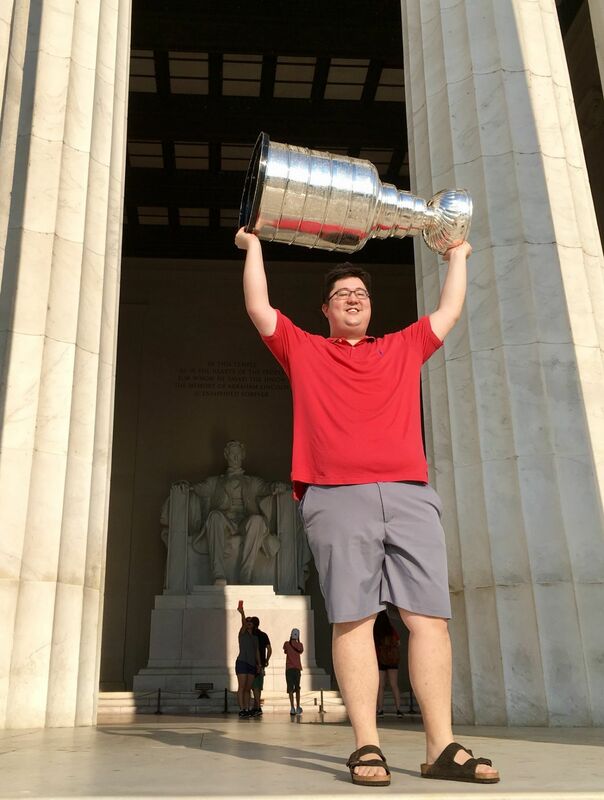 So he started the day quietly, at his favorite place in D.C., the Lincoln Memorial, for a private moment with the Cup in one of the most public settings in the city. The next day, he admitted that “my arms are sore; I should get to the gym.” Indeed, 35 pounds is not an insignificant weight. Northerners might compare it to a bag of wood heating pellets, which runs 40 pounds. Ohashi’s day with the Cup began at about 7:50 a.m. at the memorial. At 11:55 p.m., a few minutes before the official midnight conclusion, he walked the Cup out to a waiting vehicle belonging to Walt Neubrand, the appointed Keeper of the Cup that day, and placed it into its special case. Under the brief Ohashi regime, the Cup was drunk from (beer and champagne at the Cup-night party of about 15 family and friends at the Ohashi home). It was dined from, too. Ohashi ate his store-brand frosted flakes from it in the morning. Later, per a request from his girlfriend, Kahn, it served an ice cream sundae. Ohashi is quick to point out that he’s not the first Bates alum who’s earned the right to spend a day with the Cup. Jeremy Rogalski ’09, now director of hockey analytics for the Boston Bruins, was that team’s video analyst when the Bruins won the Cup in 2011.